A Special Master is appointed by a judge to make sure that judicial orders are followed and is an “adjunct to a federal court”. Federal Rules of Procedure allow a federal judge to appoint a Special Master, with the consent of the parties, to conduct proceedings and report to the court. These appointed Special Masters can be attorneys, but that is not a requirement. A common misconception is that vaccine liability funds are supplied by the manufacturers, yet I discovered that they are financed by the consumers with a $0.75 to $3.75 surcharge per dose applied as an excise tax. The manufacturers deposit this surcharge fee to the vaccine fund and deduct it as an expense from their taxes. See Also the tables for other vaccines not on this particular list. Tax is imposed on certain vaccines sold by the manufacturer in the United States. A taxable vaccine means any of the following vaccines. Any vaccine containing diphtheria toxoid. Any vaccine containing tetanus toxoid. Any vaccine containing pertussis bacteria, extracted or partial cell bacteria, or specific pertussis antigens. Any vaccine containing polio virus. Any vaccine against hepatitis A. Any vaccine against hepatitis B. Any vaccine against chicken pox. Any vaccine against rotavirus gastroenteritis. Any conjugate vaccine against streptococcus pneumoniae. Any trivalent vaccine against influenza. Any vaccine against the human papillomavirus. The tax is $.75 per dose of each taxable vaccine. The tax per dose on a vaccine that contains more than one taxable vaccine is $.75 times the number of taxable vaccines. This tax can also be as much as $3.75 per dose, per vaccine depending on the vaccine combination and tier group. This excise tax is passed on to the consumer, as we stated earlier. The question is: Are vaccines harmful? I suppose my first response to this question would be that if they are not harmful, why the fund and the special court to deal with the injuries from vaccines? If there was no evidence that these toxic concoctions cause injury and in many instances death, what would be the need? At issue of course, and probably most notable, is the relationship of autism to childhood vaccines. In the 1950’s the rate of autism was 2 in 10,000. With the dozens of mandated vaccines administered to screaming infants and toddlers, the rate of autism had skyrocketed to 1 in 150 by 2002. It is now estimated that 1 in 133 children are afflicted with neurological disorders after receiving vaccinations containing massive overdoses of the mercury derivative, thimerosal, as the number of vaccines forcibly administered increases each year. It is the parents of these now permanently damaged young children who are for the most part seeking damages although the medical community, along with their financiers in the pharmaceutical community, continues to deny there is any causal link between vaccines and autism and numerous other neurological disorders that appear after vaccination. And never mind the sudden appearance and the rise of occurrences of ADD, ADHD, and other neurological disorders that plague so many children in this country. While the pharmaceutical producers of vaccines and the FDA and a host of other stakeholders insist there is no connection to the injuries suffered from vaccines, the number of lawsuits increases each year. This increase is dismissed, even as the evidence mounts that vaccines cause far more harm than good and as the number of previously healthy children fall victim to adverse side affects. As long as vaccines are manufactured and administered in a “one size fits all” system, we will continue to see the rise in neurological disorders in children. No vaccine or medication is so perfect that it can be used across the board for everyone. Difference in metabolism, sensitivities to various chemicals, allergies, even ethnicity among many other variables, can affect the outcome of vaccination. Also important to this discussion is the infamous, untested and unreliable H1N1 flu vaccine. I can only assume manufacturers felt completely safe in throwing these vials of god knows what, into the market. After all, if you don’t’ have to worry about being held liable for the harm and injury caused by your product, what’s the difference? The very people you intend for your toxic product to be used on would be the same people who will pay the excise tax to fund their own exclusion from the judicial system and to have their substantive due rights abrogated. It’s a win/win for big pharma. It could be sudden death for the recipients of these vaccines, or, a lifetime lived in a state none of us would want to endure. And to think that as few as three carefully selected Special Masters are allowed to decide whether the death, injury or lifetime trauma to your child or an adult, has merit or not. There is something really, truly sick and perverted about this system. I just hate it when called “anti vaxer”, don’t they get it? We did vaccinate, that’s why our children are vaccine injured. Living Healthy and Worry Free » UK Finally Makes Smart Decision to Protect Children… Why Doesn’t the US? One more comment: If we had a constitution anymore, we would be free to think, to deliberate, study any subject, including vaccinations. We could then determine what would be in the best interest of our families and act accordingly. I have always felt that way when I discuss vaccines with my patients. Do I have a slant on this? Of course. But if we live in a free country we are allowed to make decisions based on the best information available. Today there is a fascistic control over most people’s minds. They think that this is the law and I must obey. I wouldn’t be any more comfortable with a “law” that denied individuals the right to be vaccinated. What demands will be next? What is the problem with some of these people? They claim if your un-vaccinated child gets the illness the vaccine is supposed to prevent, that somehow puts their protected child (vaccinated) at risk! Where the logic in that? Aren’t they immune, with their all mighty vaccination? Why would a vaccine only work, if everyone takes it? That makes absolutely no sense! The headlines today say it all about our ignorance regarding immunology. To think that an individual can receive a vaccination and then, miraculously, they are protected regarding any transfer of bacteria or virii to another is as ridiculous as getting a flu vaccine (effective rate – 1%) and thinking that you can sneeze all over the next person because you are “protected”. Please people, THINK!! The powers that be want us to not be able to think. As long as you touch or breathe in this world you can be a carrier of any bacteria or virus. If your friends have reduced Vit D reserves or are otherwise immune compromised then they will be susceptible to what they touch or breathe. It really is that simple! I see the “give’em all a jab” crowd is here. Pathetic bunch they are. They show up on every article out there just like the “depleted uranium is good for you ” bunch. Paid hacks, they all are. I couldn’t help but notice the attack was about things not mentioned in the article. The article was about the vaccine court and how it was financed not about whether vaccines were good or bad. But when you are obtuse and refuse to look at the facts surrounding this issue…..you get the hacks. As for ask your grandparents: It is our grand parents who have railed against these horrible vaccines having watched over a lifetime the horrendous results of vaccinating vulnerable infants and toddlers. It was the grand parents who remembered that it was a rare ocassion that anyone was afflicted with what is now an epidemic of neurological disorders. How can infecting your child, or anyone for that matter, think they have avoided some disease by getting a shot containing the disease? Once infected with the vaccine, which is what happens…you are given an attenuated version of the disease, along with heavy metals, other pathogens, preservatives, stabilizers, and god knows what else, you are now infected and shedding the disease everytime you breathe and walk through a room for the next 21 days. This is called viral shedding. Who, is infecting whom? Herd immunity? No such things these days unless you are maybe in an Amish or other community that does not recieve vaccines. How is it in these communities, ADD, ADHD, and autism rarely if ever occurs? In many cases not at all? Lets see; the Sabine Polio vaccine contained SV 40 cancer virus but they continued to use it until it was gone up to 1992. The yellow fever vaccine contained a leukemia causing virus. Just two….but you can see the pattern. I think its unfortunate that some think science, particularly bad science, is the answer to everything. Try telling a parent who is holding a now permanently damaged child how great vaccines are. I think u need to take ur pills. This is a giant pack of lies. The anti-vax crowd always has to misrepresent science and as usual the comments here are full of ridiculous bunk. Ask your grandparents what it was like to see people around them die of what were called childhood diseases. People like this are harming our herd immunity. Please get an education. If jokers here don’t believe in vaccines and their disease-ridden child infects another and that child dies – will they be facing criminal charges or a lawsuit from the parents? No because disease is an act of God? If the other child was too feeble to fight off the disease then it’s the child fault? There have been large numbers of cases of Attention Deficit Disorder in the UK. Each and every time this becomes newsworthy, the cry is that it has nothing to do with vaccines. I recall in or around 1960, I was to be vaccinated with the Smallpox vaccine but at that time my parents were told that I could not be vaccinated because I suffered from a skin condition. As a result I have never been vaccinated against this disease. On the other hand, my sister (8 years old than myself) was vaccinated against smallpox. Shortly after having the smallpox vaccine she became extremely asthmatic. I though never became asthmatic. When my only child was born, I was pressed and pressed by the doctors surgery to have my child vaccinated with the MMR vaccine. My Uncle pressed me to wait until she was older saying to me that as she was so young (six months old) as her immunity would not be able to tolerate three vaccines in one. I waited but the pressure from the surgery was intolerable. My daughter was 5 by the time she had her vaccine and, frankly, knowing what I know now, I would not have had her vaccinated with three vaccines in one. Single jabs maybe but not all in one. I never take any flu-shots,never any vaccines.Don’t listen to those little devils from satan synagogue(Revelation 2:9,,3:9).Here you have the whole truth for free,just read this book. Who Is Esau-Edom…Who Is Esau-Edom.. I would have to ask Jeannon what “carefully selected ” means. Some of you out there who have been around a while may remember Dr. Mendelsohn, pediatrician. I watched him in his newsletters, one by one, reject vaccines until finally he was down to a list of 0 that he considered to be safe and effective. This is a system that has gone mad. If you want healthcare anymore you will have to go outside the boundaries of the healthcare system. 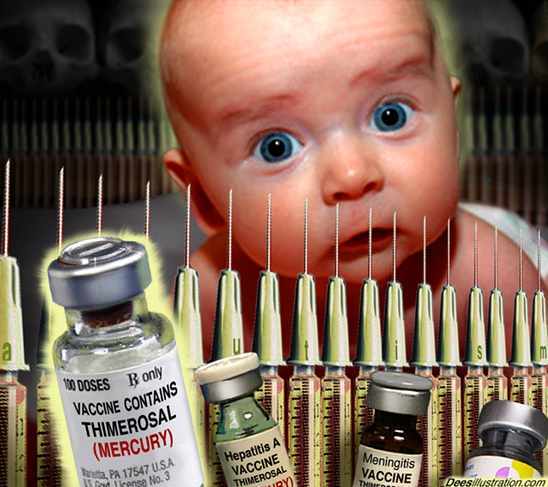 If you opt for a few “chosen” vaccines they will strongly expect you to comply with the rest. I have seen this happen over and over. If you want your children safe, keep the poison out of their bodies. If you look back at the history of vaccinations, most typically the “disease” was already on the decline before the vaccine was even released. This was true with the polio vaccine and is most assuredly true with chicken pox. By the way, shingles has gone up astronomically since the release of the chicken pox. More iatrogenic fodder for the AMA, giant pharma. I didn’t realize that the vaccine liability fund was funded via a tax. Big pharma isn’t spending one single cent compensating it’s victims. It’s almost as though vaccine dupes are paying an insurance premium when they purchase vaccine. When it comes to chemicals and other injectables, our “Constitution” (notice the quotes) has an interesting item they have enumerated into it as a “certain right” (those quotes again). The Amendments numbered 18 and 21 have a certain item enumerated, specificly listed, and it specificly determines that ‘certain rights’ function. The key word here is “intoxicant” (quoted) listed as this ‘certain right’ relating to “liquors” ( I do not use quotes lightly). An even more interesting part is one of the original amendments the authors were wise enough to enlist into OUR rights and law makers restrictions. Remember that those men that wrote these rights were not ignorant cowards. They were revolutionaries that fought hard for what we now have. In theory that is, to be precise. The amendment number nine states as clear as any law can ever be in the land of legalese. “The enumeration in the constitution of certain rights, shall not be construed to deny or disparage others retained by the people”. Bill of rights, 9. I know this is about health care, and the prevention of illness with vaccines and the special legal protections the makers of these toxins receive. While it is not the use of drugs, the base principle is laid down in our laws with the invalid policy of prohibition carried over into the practice of medicine and health care. They shall determine what is best for you if you like it or not dominance. When you have overseers that will happily ignore their oath of office as they hired on with one hand on their Bible, think of the example I pointed out with the ninth amendment and prohibition(s), would, could or should you trust them with these vaccination decisions? They seem to carry an aura of ill will toward the people they claim to represent. Forcing them to purchase health insurance or else face a fine or worse at the deadly end of a gun if you do not buy a health insurance policy… think, who do they really hate with a “law” like that, and you will allow them to jab you with who knows what? So they have special protections in legal matters, even more reason to RUN when they show up with the jabbers. And the children of the good ol’ days before vaccines all grew up healthy and lived happily ever after. I seem to remember that the U.S. Government told us the swine flu vaccine didn’t have thiomersal preservative in it. Another lie as it turns out! I think everyone should avoid taking vaccines altogether. Parents need to read up and very judiciously perhaps opt to have one or two single vaccines for their children and themselves. we not only distrust our local pharmacies who are pushing the flu vaccines, we more importantly have a growing distrust of our doctors. I would say we have a total system breakdown. People should share their knowledge and help each other because we are all under attack. You should watch this lecture by Russel Blaylock: http://www.youtube.com/watch?v=aUCCdCecLTo. It might help your son. I am 58 years old. This is one of the reasons why I voided having children! Bad time to be raising children at this time in the US! 1990 was the last time that I had any kind of vaccine ( tetanus toxoid, required, working in an office job at hospital). No more jobs requiring me to have a vaccine or flu shot! Last flu shot that I had was in 1973 (US Navy Reserve). Since 1990, I can only remember having the flu two or three times, and I healed myself with natural remedies. In fact, it is very very rare for me to even see a Doctor, since I am able to heal myself with natural remedies NEARLY ALL OF THE TIME! I will NEVER take any more vaccines or flu shots! Good for you. Nice to see the list. My son is vaccine injured. He has asthma type symptoms. Some nights it’s so bad, we’re up most of the night with him. It’s an inflammatory immune response, which is what the adjuvants are supposed to create, but in our case, the response is to intense. We know this condition is caused by vaccines because, the onset of serious symptoms occurred about 3 to 5 days after the administration of the vaccine. We took him to the emergency room, where the E.R. doctor asked us straight away if our son had recently had a vaccine. When we said he had just had one, he explained how the vaccines cause inflammatory responses, especially in the lungs in some cases. This is what causes the asthma type symptoms. The symptoms can be so severe as to cause death in some cases. Our son cannot sleep on his back, or sleep lying down sometimes, and actually has to try to sleep in the sitting position, which is easier to breath in, for some reason we can’t figure out. Don’t allow the doctor to give your kids ANY vaccines. They are all scams. The vaccine injury fund is just more evidence of the fact that vaccines are one of the biggest money makers for the medical community. Not only from the sale of the vaccines, but also from the future treatments and drugs needed to deal with the vaccine side affects. It’s a way of creating future business…vaccinating kids, then treating their autism and ADHD, and ADD, and respiratory problems throughout the rest of their lives. What a diabolical business plan! Remember: The Constitution has been violated by the last 5 presidents and Congress groups 1,000s of times….and nothing has happened to ANY politician or party (Dems or Reps)! It’s a total joke to say, unconstitutional this or that. Corporations rule the World. PERIOD. People are just overhead and an expenses to Corporate philosophy. That is why nothing is improving for our Society except, for the rich. Be ready to leave your kids a World that is in worst shape than when you inherited it!